Most people prefer to work with a fresh canvas. Imagine painting your masterpieces on someone else’s painting. This is probably why brownfield sites are not the most desirable land to start building projects on, commercial or residential. Greenfield sites are a clean slate, previously unbuilt upon and typically are cheaper and easier sites for construction, but as the countryside in the UK rapidly disappears and the population increases, it is time for developers to start re-considering brownfield land. So, what are the issues with brownfield sites? Generally their previous use will have left a mark, either with run down derelict buildings or with actual waste. Immediately this doesn’t sound appealing to developers, however there are benefits to choosing Brownfield over Greenfield. Brownfield land sometimes comes with an urban backdrop, for example in cities/ towns, this desirable location can mean there is an increased amount of foot traffic if developers’ plans are commercial. Also, by removing potentially hazardous items, derelict building or waste, a developer can increase property investment value by improving the location, making it more desirable and promote future urban rejuvenation. It can preserve historical or listed buildings, sometimes the upkeep of these buildings becomes too much for their owners so they end up derelict or abandoned. It would be a shame to see once beautiful properties left in ruins when they can be revived. It may be easier to get planning permission to build on Brownfield sites as something has already existed on the plot before, whereas the permission to build on Greenfield could take longer due to the fact that it is brand new and hasn’t previously been built on. Possibly most importantly of all, opting for Brownfield land can help preserve the Green belt, these are important as productive farmland or as environmental conservation land. How can developers overcome the challenges of brownfield sites to actually physically start construction on them? Firstly, it has to be established whether or not the contamination of the land is a risk, sites that have potentially hazardous contamination include former factories, mines, steelworks, military bases and landfills. It is the responsibility of the land owner to determine whether or not a site is contaminated. If it is found that the land is contaminated, developers may have to liaise with the Environment Agency, they will advise whether or not an environmental permit is needed. Also, planning and environmental departments will be able to give advice on the issues that arise with suggestions as what remediation work is required. Once the site is clear, there will be changes to the way that the actual building can be undertaken as well. For example, the foundations. The quality of foundation is integral to the stability and longevity of a building. Being previously build upon, the ground conditions of a Brownfield site may be challenging, particularly if the site was a former landfill or quarry. This can make excavation impossible. In these cases it may be worth looking into different foundation options, such as raft foundations. There are two types of raft foundations, Housedeck and Comdeck, the main difference being their either residential (Housedeck) or commercial (Comdeck) use. Raft foundations, due to their versatility are suitable for brownfield sites of all types. 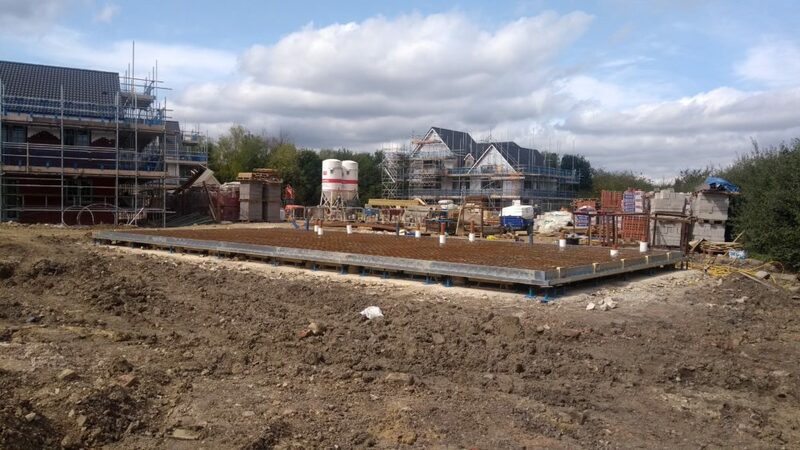 As rafts can be ground bearing, supported on piles or improved ground, they do not require trenches, are usually quicker to complete and more robust than a traditional foundation. Thanks to their shallow profile and with the use of innovative piling techniques, spoil arisings can be kept to an absolute minimum. They also have the added benefit of generally having a reduced carbon footprint. Housedeck is ideal for any site, even with nearby trees, due to it’s because of its ability to build over tree root protection zones using mini piling rigs, hand pre-augering and a voided slab, and they can support frames of any type including brick, timber and even steel. Once a solid foundation has been established the rest of the build can progress as usual. Developers should remember to check whether there are any restrictions with the appearance of the finished build. Conservation areas will have rules about only allowing builds that will enhance the character and appearance of the area. For example, a glossy white, glass fronted property is not likely to be approved in a rural, small village. There are a few hurdles for brownfield developments, but the finished project can be rewarding once these have been dealt with. Building a new home? The do’s and don’ts. What Can I Do About My Neighbour’s Nuisance Tree? Who Can Certify That Works Comply With Building Regulations?